IT SEEMS THE DEFENDANTS HAVE BARRON/REDDING, JUDGE JAMES B. FENSOM’S OLD FIRM, REPRESENTING THEM INSTEAD OF BRIAN HESS. GUESS WHO REPORTEDLY WORKS FOR THEM???? I HEAR CAROL LYNN BRUST GRISSETT…. REMEMBER WHITE WESTERN MEN’S CLUB??? Paid the bulk buyer from Association funds $551,171 over the past 3 years for a debt going back to 2009 that the association did not owe. ELEVEN MILLION, NINE HUNDRED AND SIX THOUSAND ONE HUNDRED AND SEVENTY ONE DOLLARS. YES, that is the amount the jury awarded the Association at Shores of Panama. It is $1,906,171 in actual dollar value that they took from the association and $10,000,000 in punitive damages. There is a lot of work to go and we are already planning our next steps with our attorneys. The Federal trial established the framework for success in the remaining legal actions coming this year. We believe we are in very good position for settlement discussions. For those owners who want to settle…this puts us in excellent negotiating position. Personally I want to thank all owners who believed in the board, supported us, prayed for us and never gave up hope. I want to thank John Townsend and John Cottle from Becker & Poliakoff for doing outstanding work as our attorneys. Personally I want to thank Denise Hindes who led the legal effort and put 100’s of hours into all our legal efforts. I surely could not have done anywhere close to what Denise was able to accomplish in her leadership of our legal actions. Personally I want to thank the board directors who stuck to our strategy in the lawsuits. We believed we were justified in all our dealings. And Personally, I want to thank my circle of close friends who are owners at Shores. Your support, encouragement and comments of appreciation sustained me over the past years. We, the board, commit to look out after the interests of all unit owners. There is so much more to come. I’ll be providing another update soon. Shores of Panama Resort Community Association owns and is entitled to exclusive possession of the front desk at Shores of Panama I as part of the Commercial Registration Unit. The Clerk is directed to issue a writ of possession in favor of Shores of Panama Resort Community Association to eject Shores of Panama Club LLC from the front desk at Shores of Panama I.
Shores of Panama Club, LLC shall provide to Shores of Panama Resort Community Association an accounting of the income and profits received from its operations of the front desk. This is a huge win for us. It’s interesting that the judge is requiring the Club to give the association an accounting of the revenues and profits of the front desk during their use of our property. It’s too early to determine the reasoning behind this order but must certainly be good news for the association. We have a closed board meeting with our Attorney this coming Monday to discuss the proper and legal process to take over of the front desk. Although we know in general what we will be doing with the front desk we will need to quickly decide on the certain steps to make the front desk beneficial to all owners. As expected the Bulk Buyer has already issued a request for a “stay” to Judge Overstreet’s order. Our attorney’s has already written our response to their request of the stay. We are tweaking the response and will it with Judge Overstreet first thing Tuesday morning (Court is closed on Monday). We feel good that our response very sufficiently expresses the reasons the “stay” should not be granted and that the judge will not order the “stay”. The hearing for the motion is scheduled for this coming Tuesday afternoon. Federal Trial: NOT SO GOOD NEWS about the Federal Trial. Judge Hinkle issued the order that the jury trial will take place in the Federal Courthouse in Tallahassee. Although we are challenging the change of location, it looks fairly certain that the trial will be held in Tallahassee. The facilities in Tallahassee are significantly better than those in PCB. Trial starts at 8:30 Monday Jan 25th Eastern Standard Time. Jury selection will take about 2 hours and then will go directly into the trial. Monday is when the plaintiff and defendant attorneys give their briefs. Actual testimony could start sometime that Monday afternoon. On Tuesday, Wednesday and Thursday the trial will begin at 9AM. Note that Tallahassee is in Eastern Time Zone which is one hour earlier than PCB. The Federal Courthouse is downtown Tallahassee at 111 N Adams Street. There is no trial on Friday. If we are not done the first week, the trial will resume on Monday Feb 1st. Denise, me and our attorney will be staying in Tallahassee from Sunday until Thursday. If necessary will return the following Monday. Owners are welcome to stay in Tallahassee or do day trips. It is about 2 ½ hour trip to the Tallahassee courthouse. Be sure to factor in that Tallahassee is in Eastern Time Zone. This is a mass email with blind copies to about 425 owners. It contains information about what is going on at Shores of Panama to help keep you abreast of the issues. Although I am on the Board of Directors, this email and information is NOT official Board information. All official Board communications will come to you via EmeraldView Management. COURT NEWS: Update on the May 14th weekend: On the morning of the scheduled deposition of Serge Halberthal (April 23rd) the bulk buyer’s attorney filed an emergency motion for protective order to prevent Serge from being deposed. The bulk buyer also filed a motion to strike and vacate our dismissal to nullify settlement agreement and nullify the quit claim deed. (The Proxy) In short, the bulk buyer is arguing that Judge Fensom doesn’t have jurisdiction regarding the beach settlement agreement since it was dismissed by the Bulk Buyer controlled BOD after the fraudulent quit claim deed was filed. As a result of this stall tactic our attorneys filed a motion for continuance in order to obtain Serge’s deposition prior to the beach settlement being heard. Judge Fensom granted us a continuance in order to secure a deposition from Serge prior to the beach settlement hearing. Unfortunately, this will cause the beach settlement hearing to be postponed to a future date to be determined on May 14th. On May 14th there will be a short hearing to determine if Judge Fensom has jurisdiction and if not the case will be heard by Judge Overstreet at a future date to be determined. If Judge Fensom determines that he has jurisdiction the COA attorneys will request a new hearing date where the beach settlement agreement along with the beach lawsuit will be heard simultaneously. This could dramatically speed up the entire process if both are heard simultaneously. PROXY VOTE: I’m sure you are all aware of the Proxy vote for the beach that took place April 18th. Since the old board deeded our beach to one of their LLCs it is necessary to go to court just to get back what was already ours. Florida Statute 718.3026(3) provides a possible way that we can rescind the beach settlement agreement. This is the reason for the proxy. We need a 50% plus 1 vote to obtain a majority. That is 388 votes. We received 405 proxies so successfully gained our goal. It was filed with the courts so is officially on record. It will be used in the court hearings. FEDERAL LAWSUIT: There is a trial by jury in November in Federal Court. In this suit some current and former board members are being personally sued for actions they took while being on the board. In this trial the Board is asking for reimbursements for actual and punitive damages. The bulk buyer filed to have the suit dismissed but just 2 days ago the federal judge ruled that we have a valid suit and rejected the bulk buyer appeal. BUILDING SHIFT: It is unfortunate that an owner (Mr. Bill) sent out a mass email implying that we might have trouble with a shifting building. Personally I look at the email as a “The sky is falling” tactic. Why this was done I don’t know. The Board, our maintenance, original developer, FDIC, management companies and an engineering company have known about this for years. About 3 years ago the engineering company installed a meter device on the gap so it can monitor any shift. It is common to have a slight amount of shifting in a building. During initial construction the 2 buildings were not perfectly aligned. The Board and management company are monitoring it and as of now there is no significant movement. No need to panic. This is also part of our building defects investigation. On Wednesday June 25th the Division ruled on the recall and the ruling is in favor of us owners. Effective June 25th the four new members filling the board positions are owners Denise Hindes, Jerry Dow, Enoch Hartman and myself. This completed our 7 month recall effort. On June 30th we held our first organizational board meeting and election of officers resulted in: President – Dean Lautzenheiser, Vice President – Denise Hindes, Secretary – Enoch Hartman and Treasurer – Jerry Dow. The other three board members controlled by the bulk buyer did not participate in the board meeting. I see this as consistent with their past behavior that they do not want to work with owners. After that Monday board meeting we stayed at Shores through Thursday and put in 12 hour days working on organization and issues and priorities. Denise also spent very significant amount of time both at Shores and from home working on the same and we had a couple other owners working with us. Fact is our team put in a massive amount of work to get things started to correct so many issues at Shores that have been ignored for so long. The next step was a 2nd board meeting slated for July 7th to get board vote approval to move forward with our plans. About 45 minutes prior to the July 7th scheduled board meeting an attorney for the bulk buyer showed up with a court injunction to stop all board activity. We had to cancel the meeting or be in contempt of court. The bulk buyer also filed a “trial de novo” with the circuit court to contest our winning the Division ruling. What does that mean??? It means we will spend another $8,000 in attorney fees to defend our position. We have a very strong case and their filing is very weak. It is only meant to stall the inevitable and cost us money. The bulk buyer claimed they will out spend us in legal proceedings to get their way. This is there latest effort. Unfortunately because of the way these are filed the payment of attorney fees relies on contributions. Only 1/3rd of the owners are contributing money to our legal efforts to save Shores. We need contributions to pay the attorney. Please contribute. A consultant hired by the bulk buyer, Jack Gold, has been calling owners to solicit input on how to solve problems at Shores to benefit everyone. He talks of working together to make the place better, but does not want to hear the 2 year history of the bulk buyer not willing to work with us owners. Jack is a consultant with probably no powers whatsoever to make changes at Shores. He would not tell me who specifically hired him. He admitted he has no authority to sign any contract or agreement. He said he is a “listener” and will report his findings to “someone or all”. He would not say who he reports to. We briefly discussed a face to face meeting next Thursday but he couldn’t commit to be able to sign any agreement or make decisions to move forward…he would only be there to listen. No need for any meeting with him. Three bulk buyer employees from their Brooklyn NY home office have been to Shores to “listen” and nothing ever came of it. I believe Jack’s true mission is to contact owners to make them feel like the bulk buyer really cares about us in hopes that we will be nice to them and maybe even vote for them in upcoming election. “The best prediction of future behavior is past behavior “– Dr. Phil. The bulk buyer has never acted on any requests given by owners. Don’t expect this behavior to change. We have a hearing with the judge next Wednesday, July 16th at 3:30. This hearing is before Judge Fensom to dissolve the injunction that the judge ordered. The injunction did not remove any of us owner Board members, it simply stopped us from making any Board decisions. Our attorney, working mainly with Denise, created a very good strategy and defense. Their evidence plus the witnesses called to testify will present a very compelling case that we think the judge cannot ignore. We feel confident that the injunction will be dissolved and we can move forward with making changes at Shores. We will stay after the Wednesday hearing to work on matters going forward. Our next hurdle that they threw at us is the trial de novo and we should have a court hearing before end of month. Nothing will change unless we stay the courses and be in control of the Board. Please consider donating to the legal fund if you have not yet done so. Contact me and I can give you the details of contributing to the fund. Our recall effort started January 6th when we turned in 404 votes to the Division for the recall. This Wednesday June 25th the Division ruled on the recall and the ruling is in favor of us owners. Effective June 25th Stewart Berman, Aaron Klein, Solly Halberthal and Isere Halberthal are no longer on the board. Effective Wednesday June 25th the four new members filling the board positions are Denise Hindes, Jerry Dow, Enoch Hartman and myself. Effective immediately the individual owners now control the majority of the Board while the bulk Buyer has a minority 3 members! It was a 6 month effort but we finally cleared this first big hurdle. We anticipate that the bulk buyer will create more hurtles to overcome. The good news is that in having the majority of the board, we are in a much better position for addressing future issues. The first Board meeting of the new Board will be Monday, June 30th at 1PM. Since the COA has no suitable meeting space at Shores we will have the meeting off-site. 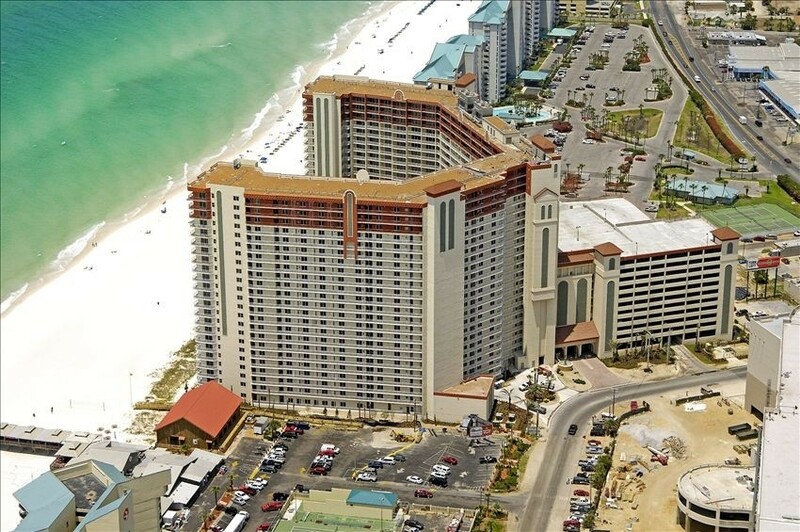 It will be held on the ground floor Event Center at Grand Panama Beach Resort, 11800 Front Beach Road. This is about 2 miles west of Shores on Front Beach Road. The Event Center is on the ground floor in the tower on the north side of the road…not beachside. When turning in you will see a garage tunnel through the building. Go through it and park anywhere on the west side or in the 2 story parking garage west of the tower. This first board meeting will be organizational in nature to elect new officers, talk about financial transition, building security transition, association records transition and other matters that may come up. At least 3 of the new board members will be in PCB most of next week to have meetings with the management group and others to get things rolling. Some things we will be able to do quite soon but other things will continue to take court action. We will be researching these next week. We thank everyone for their support. We will need many volunteers in the near future to work on various projects. Let me know if you can help…have already heard from several volunteers. Many, many owners have written about their disgust of Shores and their dreams of a great beach investment evaporating. Some are getting out. Others can’t. We are the unfortunate investors of a developer’s greed by keeping the pools, front desk and commercial areas as private, for profit business. To top it off, we are the unfortunate recipients who are receiving even worse economic strangulation by a group of greedy business people out of Brooklyn New York. And that strangulation can only be resolved in court…they are not about to negotiate anything with us. They won’t even reply to my emails. The recall has been 4 ½ months in the process so we are getting very close to a decision. We are confident we owners will take over the majority of the board this month. Unfortunately we were assigned a very incompetent arbitrator on our case. The legal suit against the Club concerning amenity fees and egress/ingress is basically on hold until we take over the board. Serge’s Club tactics for wrist bands, rude front desk employees, rude pool guards and general owner and guest abuse is getting worse. There is no evidence at all that without legal and board action from us owners that things will improve. “Serge’s group” just doesn’t care about us. Be sure to read the last paragraph in this update. Our recall effort started January 6th when we turned in 404 valid votes for the recall. Of course the Board rejected it by claiming, without any evidence, that 167 ballots were forged. Unconscionable! The arbitrator assigned to our case is Leah Simms and she has proven to be incompetent. Instead of going into the disgusting details, just read the attached article about Leah Simms. We are not the only COA suffering from her actions. Last Friday we sent a letter of complaint to the Director of the Condo Division at the Department of Business and Professional Regulations. We will aggressively pursue our complaint to get resolution within a couple weeks. It is expensive to have our lawyer involved but we have no other options. The sad thing to consider is that if we had gotten a competent arbitrator in January, we would have taken over the board months ago. WHEN WE TAKE OVER THE BOARD THERE ARE SOME THINGS THAT WE CAN DO IMMEDIATELY. We will take the locks off of the COA gates. The Club cannot have any locked gates if they are not hooked into the fire alarm system. The COA owns the fire alarm system and we will not let them tap in. That eliminates them from just installing their own locked gates. We will take control of the finances. They just bounced a $130,000 association check. We do not know how much money we have in the bank. We do not know if we are paying our bills. We will make the Club pay their portion of electricity, water and garbage that they are using off the Association. We will find out if we have adequate insurance for the building and insured at the proper FEMA designated flood zone. We will have a manned front lobby desk for security, owner and guest help. We will make a 2014 budget and abide by it. We will find out the details and costs of the internet system. We will immediately start the cleaning of the building and repair of equipment. We will proceed with the lawsuit about amenity fees. We continue to get reports from owners and guests at Shores that the building looks as bad as ever. It seems some of the damage and filthy grime from Spring Break has been taken care of but the building is in need of an overall good scrub-down. The CAM told me a month ago that he was looking into it but no action yet. The new general manager is Steve Dunn and he can be reached at agm@shorescoa.com. My recommendation is not to call the Front Desk for anything other than wrist band issues. If you have a unit problem it is best to call Security. We are getting constant owner and guest stories of very bad experiences in getting wristbands. Rules change constantly. Per the Club Agreement that we are supposed to abide by, owner guests and guests staying in the owners unit have the same rights as owners. Thus it is illegal for them to be charging in the first place. This is at the very core of our legal suit. It is quite clear that “Serge” will not give up this free $2 million revenue stream without a major fight. It has to go to court if we ever want relief. That costs money. The lawsuit is still in place and we are waiting for the Recall to get approved before proceeding. It appears all upfront motions and delays are done so ready to go straight to discovery, depositions and then trial. A Developer (Breland) lawsuit has been filed against the FDIC and bulk buyer that may help our case too. Serge has filed a personal lawsuit against me and my wife via one of their LLCs, Shores of Panama 1. That was filed December 31, 2013. My attorney replied with a Motion to Dismiss. Nothing was heard from them until last month when their attorney agreed that their original filing was poorly written and redundant (they originally had 147 counts against us). He said they would revise their suit against me and refile. Basically, the suit says Dean and my wife Rhonda are liars, we hung around the sales office and harassed their sales reps, we sought out potential owners and convinced them not to buy at Shores and stopped the sales of units to the point that they could not meet their mortgage requirements and had to refinance because of us. Of course their filing had no documentation or affidavits attached to prove their claims. Rhonda and I are not in the least concerned about losing this lawsuit. We believe it is solely intended by Serge to intimidate us and cost us legal fees. We are not intimidated but are paying fees out of our pocket. I have mentioned previously that they are ruthless. They use legal suits at their whim whether there is a case or not. The normal asking contribution has been $500 per unit. We ask owners to contribute what they can…we appreciate all donations. We have received donations from $100 to over $4,000. Please contribute what you can. You can send the check made out to me at our home address below OR you can make the check out to Becker & Poliakoff, our legal firm. Please join in. If we have no money to pay the attorney, it is certain we will have to stop the suit and the bulk buyer (plus Serge) will “rob” each unit between a $1,000 and $2,000 in amenity fees EACH YEAR. It has to stop.